Yoyo Chen Suspected To Be Pregnant At Wedding Ceremony? Yesterday, November 11, 2011 (11/11/11) was an auspicious date that will not be chanced upon in another hundred years. The “six ones” found in the date of 11/11/11 symbolized the singular devotion of the heart and mind for the rest of one’s life. Numerous newlyweds chose to get married on this special day and TVB artists, Vincent Wong (王浩信) and Yoyo Chen (陳自瑤) also obtained their marriage registration yesterday. Vincent was unaffected by recent rumors linking him to model, Cammi Tse (謝芷蕙) and possessed high spirits at the marriage registrar. Rumored to be pregnant, Yoyo’s cup size appeared to have increased in the low-cut neckline of her wedding gown. Yoyo appeared to be pregnant and perhaps the chance of a “double happiness” for the newlyweds was highly likely! Yoyo and Vincent obtained their marriage certificate at 11 AM at a registrar in Tsim Sha Tsui yesterday. Originally, the couple wished to hold their wedding ceremony at 11:11 AM due to the auspicious time. However, another couple had secured the booking for that time frame two years ago. Therefore, Yoyo and Vincent settled to have their wedding ceremony at a later time. This did not affect the couple’s mood and the pair complied with the reporters’ requests to kiss repeatedly before the camera. 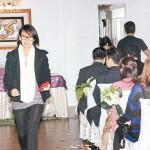 At the wedding ceremony yesterday, Yoyo’s chest appeared fuller than before; her figure was excellent. 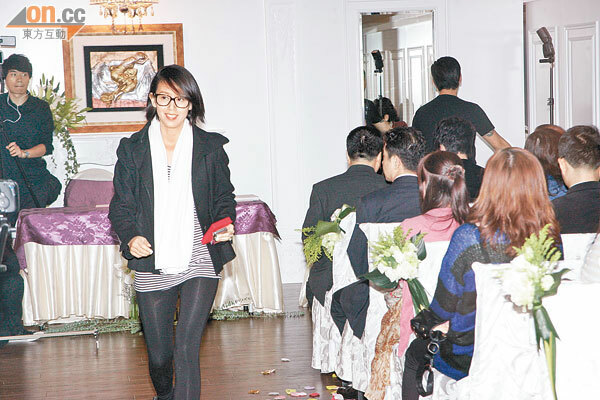 Throughout the entire ceremony, Yoyo used her bridal bouquet to block her belly area. Vincent clutched her waist tenderly and knelt down with care to rearrange the train of her gown frequently, afraid that Yoyo would trip and fall. Reporters asked directly whether Yoyo was pregnant. Vincent only admitted that he wished to have a “dragon son” in 2012, which will be a year of the dragon sign. Originally needing to work yesterday, Yoyo thanked the production crew in allowing her to take off the prior evening and adhere to the traditional Chinese hair-combing ceremony before her wedding day. Earlier, Vincent Wong was implicated in romantic rumors with Cammi Tse. Vincent had already clarified that he did not know Cammi well. Asked whether the rumors affected his mood, Vincent said, “Let’s not talk about that! No, it did not affect my mood.” Yoyo indicated that she did not wish to respond further to the irrelevant news. Jayne: Congratulations to Yoyo and Vincent! I suspect that Yoyo is pregnant and we will see a beautiful baby soon! 49 comments to Yoyo Chen Suspected To Be Pregnant At Wedding Ceremony? P.S: Is it me or does Yoyo resemble Sonija a lil in the first pic? Why do guests dress so casual to weddings? Toby Leung looks like she just woke up.. and the woman in the blue/black sweater!? I was thinking the same thing, too. But after reading what Tracy said, I think this was only the ceremony to obtain their marriage certificate. The wedding reception is not until the 13th. Congrats to the both of them! Pregnant or not, it doesn’t matter and time will tell if the rumor is true or not. Yoyo looks gorgeous in her wedding dress and Tracy looks pretty as well. I wonder if they planned it to have a dragon baby?? Believe it or not since some people are crazy about having kids born in the year of the dragon that they would plan the birth.My friend’s husband’s birth was planned just so he can be a dragon. I guess since next year is a dragon many are hoping to have a dragon baby. I think she is pregnant and congrats to them! Dragon baby will only good if he is a son. Because girls who born in dragon year is predicted to have a hard life. Of course. To say something about horoscope it can be right or wrong in each ppl. Nobody has a great life for the whole life and you can take it in heart. Of course everyone will have both good and bad in their lives. But some have more good than bad… It will vary from person to person and who knows about all of this horoscope stuff?? It can all be BS for all we know. You ask about dragon babies. From the aspect of horoscope, baby girls of dragon year are predicted to have hard life. It’s a common experience. Of course, it will be different to each person. Nobody say that ALL the girls in dragon year must be unlucky. Then I don’t understand why you give out the example of your two friends. Moreover, until they die then can know their life is harder than others or not. Some seems to have more good than bad in a certain period of life but can’t say that other periods of life will be the same. It’s a balance. Life has good and bad time. Only this person can know the best how his/her life is. Horoscope is just the common experience and it seems to be true when look at the outside of a number of ppl. I hope this is not true since my sister is a dragon girl. Fox, everyone wants their child to be a dragon. Whether hard life or easy life has nothing to do with which year you were born. I have never heard of girls in dragon year will lead a generally hard life. It all depends on time. You can be in drgaon year, but born during another’s sign;’s hour, the element is also one of the factor. Fate is of course pre destined but with a bit of work you can alter your destiny but within the confines of your fate. Horoscope is that, if you blv it, it’ll be true and if not, it won’t :P. Nothing is 100% accurate. Dragon girls are predicted to have a hard life because in accordance with the view of ancient, dragon is an animal that required strong to bear it. That’s why the guys can balance dragon fate but the girl – weaker side can’t. However, dragon girls won’t have as hard life as ox, horse, monkey, chicken year because these animals seem to have more hard life. But if ox, horse, monkey, chicken are born in the night, they might have better. Worst year for girl (horoscope) is Tiger (but for boy is good) because they are said to have not very good love and marriage life. Best year for girl is rabbit and goat. Best year for any gender is pig (because pig seems to have good life, only wait to be fed). haha, bc a chicken born at night don’t need to work like they do in the morning. That was at least in the ancient view. Modern technology will make a chicken work 24-7 plus no walking space i.e. live in a cage. Fox the way you go is strong animals mean girls have hard life, so the best for girl is bunny rabbit then? Fluffy, cute? I disagree with how you see it. If a girl is born a dragon, or whatever else, she adopts teh characteristics. Meaning she is strong, wilful, opinionated as a dragon because that’s what dragons are. In the olden days a girl with an opinion is a big no-no but modern days, it is to be encouraged. You can’t make the animal suits the gender, but rather the gender adopts the positive and the negative of the animal, that the child shall resemble that animal and frankly usually quite true. So it doesn’t mean dragon girl will have hard life or tiger girl will have difficult marriage or something like that because you can’t say dragon and tiger is more male than female. It doesn’t work that way. @exoidus: Nope, still the same love. Killua and Alluka :D. I just change to a couple fanart, haha. @Funn: I don’t say it’s my view. It’s the horoscope and description of the horoscope. If you haven’t read what I wrote then ok but seem that you read without thinking about it. I don’t say a word that it’s my view, thanks. Damn. So many signs not good for girls. So, which sign not good for boys? But Fox you defend it with such conviction, surely you must believe what you wrote? Kidd, not good for boys? Rabbit. Too fluffy maybe? I haven’t heard of this either, it sounds interesting…I think you said (or the book said) that those born in the year of the pig will have an ‘easy’ life as they only wait to be fed but then ….er pork? you know what I mean? this is so interesting! so why is the rabbit and goat the best years for girls? is it because of fertility? I said horoscope say, not Fox say. I say that it might be true, might be not and everyone have hard period in their life. It’s totally depends on how you view your fate. HTS, because you say that ppl are crazy to have kids in year of dragon, I told you that they only crazy to have sons this year. Funn, no, I don’t believe nor refuse. I’m in the middle for all of these things. Good thing I blv, bad thing I ignore. Sorry to add to the fray… but personally I like Tiger and Dragon guys too! I find them big-hearted, courageous and masculine. I hope next time, I can have a dragon boy! I keep thinking vincent is from a rich family.. maybe cuz of the drama Gun Metal Grey.. haha. Your answer shows real inetillgnece. I wonder how they managed to secrure such an auspcisous date when I know couples would’ve planned the date many years ago. Just like last year with the 10/10/10. I think they’re extremely lucky to get the 11am time too. Shouldn’t it be an earlier time since 11am comes before 11:11am? She’s in that series, played as the fourth princess, semi-villain, supporting. Oh yea, thanks for reminding me… I vaguely remembered that she was one of the princesses but I forgot which one. @HeTieShou,Yoyo in My sister of Eternal flower,Hugo(Raymond Lam)g/f,very cute.. I tried to watch that series but couldn’t stand it since it was lame to me. My mom did not like it either. It is quite puzzling how one can tell whether a person is pregnant at 2 months. I can only make out a 4 month old pregnant lady! However, Yoyo looks very pretty as a bride and Vincent Wong is certainly handsome by all means. What is important is their happiness together. So, congratulations to Yoyo and Vincent and hope they will now be happy ever after! Congrats to Vincent and Yoyo! Wow, a lot of couple met each other from TVB. I wouldnt want my daugther to follow this kind of step pregnant before marriage…not a good example at all for youngers. But yet when this kind of things happened you gotta look into the bright side…at least they are married now and is good for the baby to be. I like Yoyo’s wedding dress. I like its simplicity. It’s simple but does not lack elegance. I especially like how she does her veil. It look very nice from the front. Of all the recently married bride, I think I like her wedding dress the most. Congrats. Ah.. Their acting is not SUPERIOR, but nice. I enjoyed you two. Congratulations to yoyo n Vincent. They are a beautiful couple. Always thought yoyo is cute but she looks gorgeous on her special day. Her and Vincent resembles each other. A true couple. Wish them all the best of luck. Not much celebrities last n I hope they do.